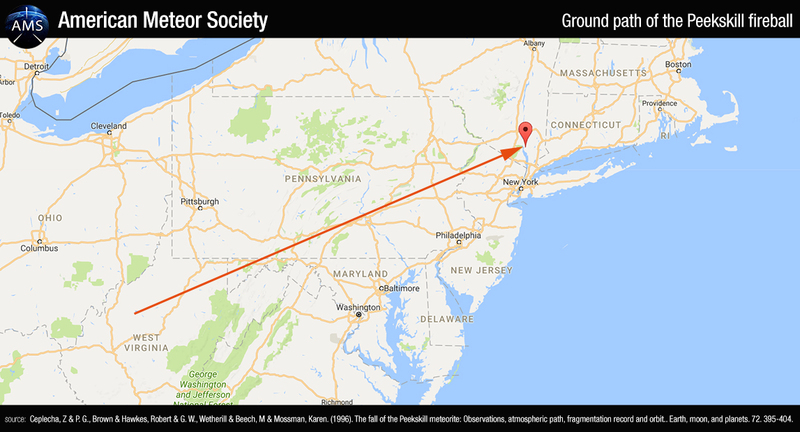 On October, 9, 1992, a very bright fireball flew over West Virginia, traveled some 700km (435 miles) north-east and ended-up its flight over the Peekskill northern Westchester County. This event is among the most historic meteorite events on record. Not only did at least 16 cameras caught the fireball on tape (mainly by high school football fans taping local games), but also a resulting 12kg (26 pounds) meteorite crashed through the back of a car. The fireball, which traveled in an approximately northeasterly direction has been described as “huge” and “greenish” by numerous eyes witnesses from Pittsburgh, Philadelphia and Washington DC. The fireball attained an estimated peak visual magnitude of – 13 (comparable to the Full Moon) and traveled at the approximative velocity of 14.7km/s (9.1 miles per second – velocity at the beginning of the video records). Twenty-five years after the fall of the Peekskill meteorite, the famous Chevy Malibu Classic is now in Paris to be part of an exhibition on meteorites at France’s national natural history museum — Muséum Nationale d’Histoire Naturelle. Brown, P., et al., 1994. Nature, 367, 6524 – 626. Beech, M., et al., 1995, Earth, Moon and Planets, 68, 189 – 197.